What have been the best movies of the year? This week’s question: What’s your favorite movie of the year so far? Despite the words that appeared on this very site, I still think about The Kings Of Summer long after watching it, and think it’s the most wonderful film I’ve seen so far this year. It’s a small, independent film directed by Jordan Vogt-Roberts, who cut his teeth shooting stand-up sets of up-and-coming Chicago comedians many years ago—people like Kyle Kinane and T.J. Miller, who are now solid draws. It’s a tricky thing to shoot stand-up: You don’t want to editorialize their set, so you have to have a light touch and let the comedy do the heavy lifting. Vogt-Roberts is equally deft in Kings, the story of two best friends who set out to build a house in the woods away from their overbearing parents. He allows the story to unfold naturally, and sparingly accents small moments to really drive home the relationships these guys have with one another. Vogt-Roberts also can meticulously compose a shot, but knows when to lay off and let Kumail Nanjiani and Nick Offerman riff off one another. Most of all, I loved Kings for how it portrays childhood friendships: messy, illogical, and necessary. It’s extremely realistic and hit me in a way that had me longing to call my lifelong chums and tell them I love them. My boring answer is Before Midnight, which is really all that and a bag of chips, but I think I’ll leave that for somebody else to talk about, and instead touch on Stories We Tell, Sarah Polley’s moving, deeply emotional documentary that attempts to take the story of her family and expand it outward into something that touches on all of humanity. Polley went in search of the true story of her mother in the wake of receiving some news that shook up her sense of herself (which I won’t spoil here), and over the course of doing so, she talked to almost everyone who had known her mother before she died early in Polley’s life. As an adopted kid, the material about families we choose to make, rather than the ones we’re born into, obviously resonated with me, but I think there’s even more wisdom and beauty in the film than just its justly acclaimed twists and meta-commentary on the form. It would be easy to forget about Stories We Tell, which barely received a release in some corners of the country, but it’s the kind of gem that sticks with you, and it’s well worth seeking out. Richard Linklater’s three-way collaborations with Ethan Hawke and Julie Delpy are turning into the 7 Up series of fiction films. Before Midnight is a lot more than just a hangout movie, but it derives much of its poetry and its power from the emotional investment that people bring into the theater with them, and it has the integrity to build on and justify that investment, instead of cheating and indulging in it. At one point, when the argument between Delpy and Hawke threatened to round some corner that they wouldn’t be able to come back from, I looked over to my right and saw the woman sitting next to me holding her head in her hands, twisting away from the screen—laughing, the way people laugh when their old friends are acting crazy, but also clearly so appalled and worried for the characters that she couldn’t look at the screen. I see a lot of movies, and I don’t get to see that every day. The distinction between “best” and “favorite” is an important one here, because while The Place Beyond The Pines isn’t the best movie I’ve seen this year (that honor would go to Before Midnight), Derek Cianfrance’s messy meditation on fathers and sons remains the one my soul just can’t shake. Sprawling and full of incredible ambition that isn’t quite realized in execution—though it’s oh-so-close—Pines unfolds like a generational horror story about how fathers inform the fate of their sons, in both good intentions and bad, and how the choices we make aren’t necessarily our choices at all, but echoes from the past imprinting themselves on the present. Because each act unfolds like an entirely new story, the front-loading of Ryan Gosling’s turn as a quietly charismatic stunt driver who turns to bank robbery to support his child makes it almost unfair to the next two more overtly quiet acts. But the emotional journeys featured in the following two acts are the whole point—and the thing I couldn’t stop thinking about for months after I saw the film. Cianfrance didn’t make a perfect movie in Pines, but he made one that hits your whole being like the most pleasant punch to the gut of all time, and that’s almost more impressive. The last decade or so has seen innumerable paeans to the arrested adolescent male, so it was nice to see the female equivalent finally get her due in Noah Baumbach’s Frances Ha. It’s also reassuring to see that, in a landscape dominated by superheroes, exploding White Houses, and fighting CGI robots, people are still making films about people, in all their messy glory. The story of a directionless twentysomething who’s slow to realize her best friend has grown up without her, the film is what Girls could be if the writing had a bit more focus (Adam Driver even appears in a supporting role). Greta Gerwig’s Frances is by turns charming and infuriating, full of impulsive joie de vivre one minute and neediness and inertia the next. She stumbles through problems familiar to many a young New Yorker, jumping from one apartment to the next, watching her career choice slip away from her, and fighting to keep pace with peers who have money and a baseline of comfort simply handed to them. Miraculously, the film has a female lead who at no point is desperate to get married or have a baby, and the few romantic entanglements we see are merely one more category of mishap. Through it all, Gerwig manages to keep Frances likable even as her flaws are increasingly on display. When she does finally take some steps toward getting her life together, it doesn’t come as a big, dramatic moment, just a few quiet reassurances that we all grow up, eventually. I have seen woefully few movies this year, which is a failing I’m trying to fix ASAP, but I’m with Todd on Stories We Tell, which is my favorite so far. My second favorite would have to be Joss Whedon’s Much Ado About Nothing. Yes, it’s kind of flimsy, but that’s the point. It’s a loose, jovial take on Shakespeare that manages to find joy when most movie adaptations of the Bard are so deathly serious (even when they’re trying to be funny). The whole thing has a winning “let’s put on a show” quality, even if it’s obvious that some of the actors are reading the lines for the first or second times, and it showcases a nice camaraderie between the actors in Whedon’s stable. And, best of all, this version doesn’t have Keanu Reeves. I have to emphatically agree with Mike—Frances Ha is the best movie I’ve seen this year. It’s absurd how close that movie cleaves to my own experience of being 27. But I’ll point to another film from this year that may well be my favorite movie experience of the year, and certainly my most anticipated. It’s not Before Midnight, though that’s another film franchise I adore—no, it’s Fast And Furious 6. This is a franchise that freewheels from continent to continent, a franchise that blissfully ignores plot mechanics in favor of cramming as many car chases into the movie as possible—and it’s just a wonderful, brassy mess of a buddy movie. I’m not a true believer—I have to willfully ignore some of the more problematic elements of the films in order to enjoy them, and I’d love a little more plot that related more closely to the characters—but put Vin Diesel and Michelle Rodriguez onscreen together, supported by The Rock and Tyrese Gibson, and it’s cinema gold, a fully entertaining movie that is somehow romantic, wistful, funny, and macho. And ridiculous. But that’s okay. 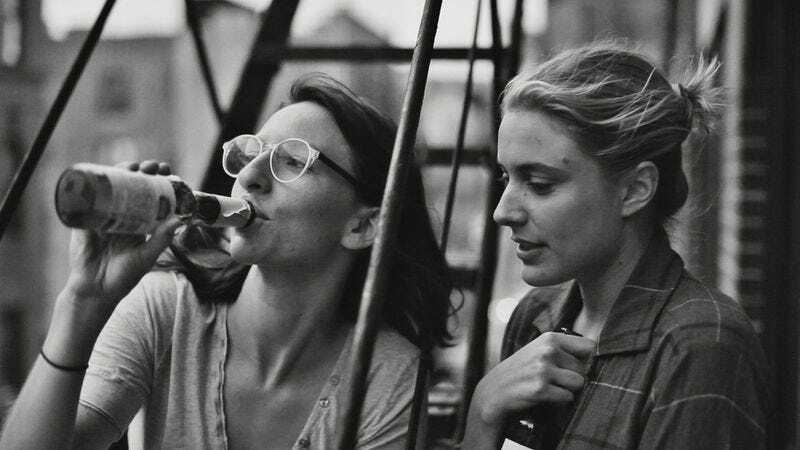 Like Mike and Sonia, my favorite movie of the year is Noah Baumbach’s Frances Ha, which is like if Girls was a French New Wave comedy subtitled in non sequiturs. Next up, though, is Spring Breakers. As lurid celebrations go, this weeklong party in the violent-crime capital of Florida is pretty high contrast. The good girl says, “It’s like paradise here,” just before a cut to another girl passed out on a stained bathroom floor. People keep insisting that this is a movie of pure visceral pleasure, but you can tell me Spring Breakers is categorically the same as other teenage bacchanalias when Project X splices a shot of bloody fingers reaching for a gun on a white piano into a house party scene. To me, despair is the overwhelming emotion, but the way Harmony Korine tells this story is intoxicating. Not, I can safely say, because of the ostensible “bikinis and big booties” M.O., nor for the alleged empowerment of a video-game climax, but for the foreshadowing cuts, the delirious soundtrack, the provocative juxtapositions, and the swirl of ideas. I’m still working through the movie, but I’ve had “Everytime” in my head for months, and I could stay like this forever. I also loved Before Midnight and Frances Ha, but my favorite film of the year (I think it’s technically a 2012 release, although most North American markets got it in 2013) is the Brazilian picture Neighboring Sounds, by filmmaker Kleber Mendonça Filho. I knew almost nothing about it going in and expected a slightly snoozy, austere chin-scratcher. Instead, it’s a lively hybrid: part Lynchian surrealist horror, part Altman-esque multi-character panorama. It’s about the denizens of an uneasily gentrifying city block in Recife, where the country’s new, entitled middle class has begun pushing out the poor or turning them into the hired help. There are many characters, but the individual stories don’t matter as much as the elusive, overarching pattern: What is it besides proximity that binds these people together? And what’s with the increasingly sinister visuals and sound effects? For a long time, I had no idea where Filho was heading, and I wondered if the film might suddenly veer into full-on horror territory. It doesn’t, exactly, but Filho achieves what Stanley Kubrick only partially achieved in The Shining: He uses horror-movie tropes to illuminate the real, unspoken horrors under the surface of human history and of everyday life. It’s a fantastic movie with a great draw-you-up-short ending. I haven’t stopped thinking about it since I saw it. Some of my favorites have already popped up here, with colleagues beating me to the punch on the exquisite post-college malaise of Frances Ha, the bewildering beauty of Upstream Color, and (especially) the blinding truth of Richard Linklater’s trilogy-capping Before Midnight. But as those have already been celebrated, I’ll call out another movie that’s fighting tooth and nail—or should I say hook and net—for the top spot on my 2013 list: Leviathan, an expressive non-fiction dive into the murky waters of the North Atlantic, where a fishing vessel hauls in its writhing daily catch. The film has been widely dubbed an “experimental documentary,” probably because it eschews the usual doc trappings—talking heads, expository onscreen text, narrative, narration—in favor of pure environmental immersion. Giving new meaning to the term “fish-eye lens,” filmmakers Lucien Castaing-Taylor and Verena Paravel plunge their durable, waterproof cameras below crashing waves and among the doomed, aquatic occupants of the ship’s killing deck. In a sense, the directors are painting with reality, on a canvas so unrecognizable it could be an alien planet. Like no other film I’ve seen this year, Leviathan transported me. It also slightly ruined my appetite for seafood, but that’s a small price to pay for filmmaking this sublimely adventurous. I really loved a lot of the movies people have mentioned—Frances Ha, Spring Breakers, Stories We Tell, Leviathan—but the best film I’ve seen this year was Abbas Kiarostami’s puzzling, hypnotic Like Someone In Love, which divided critics too much to get a ton of attention when it was finally released in the U.S. in February. Like many Kiarostami films, it lulls you in with long, static shots of people driving cars and ruminates on cases of mistaken identity, as call girl Akiko spends a strange night and a stranger day with an old academic in Japan. The plot never goes in the direction you think it will and there’s deep meaning to be mined from every passing conversation we overhear, mixed in with scenes of astonishing grace. In one long take early in the film, Akiko listens to a series of plaintive voicemails from her grandmother, waiting to see her at a train station, as she’s driven off to see her client. Kiarostami is tipping his cap to us a little bit, but there’s still never been a more bravura “listening to voicemails” scene in all of cinema. I cast my lot with Andrew Bujalski’s Computer Chess; I’m no huge admirer of Bujalski’s other stuff, but this one really got to me. Set in the 1980s, the film follows a group of computer programmers squaring off their chess programs against one another. It’s been described in some quarters as a “comedy,” but if it is, it’s only in some weird, absurdist, Beckett-ian sense. Computer Chess is an astounding movie, chock full of the weirdness of human—and machine—emotion. It’s also an artistic wonder. It’s so loosed from any aesthetic framework I can think of, be it the voguish European arthouse Dardenne/Haneke import stuff that’s coming to define a lot of American indies (see: last year’s Compliance) or even the ragged mumblecore patterning that Bujalski helped mint. Computer Chess is shot as not just as a mock documentary, but as if an arthouse filmmaker from the 1980s were shooting a mock documentary. Like a Guy Maddin movie, Bujalski’s film comes weirdly alive in its oldness: its ability to not just evoke the nostalgia for another time, but believably approach the mood of it. Maybe I was just having a rough day after saying goodbye to a close friend who was moving away, but Monsters University is the most fun I’ve had in a theater so far this year. Like Carrie, I make a big distinction between a great film and a favorite, and I’d count Upstream Color and Before Midnight in the former category. But I sat and laughed consistently for the entirety of Monsters University. All the Revenge Of The Nerds and Animal House comparisons are apt, but I laughed more at Monsters and enjoyed parsing out the voice cast. There’s a key moment late in the film when my friends and I all looked at each other, let down by the false climax of the film, which came on the heels of a raucous first hour full of rote training montages and before-they-were-buds infighting. Right when it looks as though the film is permanently stuck in disappointment, it rescues itself by building a strong foundation for Mike and Sully’s partnership. Look, everyone was wary of a prequel in this world, especially knowing where the plot would have to end up, but I found it to be every bit as delightful as I had hoped. I’ve barely seen any new releases, unless you count Jurassic Park 3D, so my choices are a bit limited. I did enjoy The Bling Ring, which I just saw last week. I’ve been fascinated with the story since it broke and did my homework (read the article/book, watched all of Pretty Wild and the Lifetime movie), so I knew that I’d like it. It was a great summer afternoon flick: a blaring Sleigh Bells track, garish fonts, an abundance of selfies, and a nearly flawless performance by Emma Watson. However, to echo Sonia, I have to say Fast And Furious 6 is easily my favorite movie of the year so far. The addition of The Rock did wonders for the franchise and turned it from a somewhat boring movie about street racing to a thoroughly entertaining (and surprisingly affecting) action movie franchise. This is no guilty pleasure; I’ll readily admit that I cheered watching cars crash into other modes of transportation, I audibly gasped at the ending, and yes, I even cried a little (I’m a sucker for love in the time of car chases). I love the friendship between Paul Walker and Vin Diesel so much that I want to put their pictures opposite each other in a locket. There was nothing I disliked about the movie—except the fact that the next installment wasn’t immediately released that same night. It’s not that I haven’t seen that many movies in 2013, but the ones that I’ve seen have all been the predictable blockbusters, so this may be the most boring pick of the bunch. With that said, I’m going to offer a possibly unpopular opinion and say that I absolutely loved Iron Man 3, maybe even more than either of the two preceding films. (I still haven’t seen it a second time, but I also haven’t found myself second-guessing the premise that it might be my favorite of the three.) I get why fans who’ve obsessively followed ol’ Shellhead’s adventures on the printed page might’ve been ready to throttle Shane Black over the way he used The Mandarin—I cringed a bit myself—but when all was said and done, I was so happy with the re-teaming of Black and Robert Downey Jr. and the decision to make the film as much of a Tony Stark adventure as an Iron Man adventure that I ultimately decided that I didn’t care. Why? Because it was fun. As much as I enjoy it when comic-book movies get dark and gritty, I also really dig an action-packed romp interspersed with witty dialogue, and, at least for me, Iron Man 3 delivered that in spades. Since a few other people named Frances Ha, my favorite commercial release so far this year, I’m going to cheat a bit and look into the future to The Past, Asghar Farhadi’s follow-up to his 2011 masterpiece A Separation. (It premièred at the Cannes Film Festival in May, will likely hit U.S. theaters sometime around Christmas.) As usual, Farhadi presents a situation that initially seems fairly straightforward: An Iranian man (Ali Mosaffa) travels to Paris to finally divorce his French wife (Bérénice Bejo, from The Artist), from whom he’s been separated for years, so that she can marry someone else (A Prophet’s Tahar Rahim). The complications that ensue, however, are entirely unexpected, involving neither a love triangle nor a possible reconciliation. Revealing much more would be a disservice, but I maintain that no dramatist working right now is as masterful at constructing a complex narrative that reveals character by tiny increments, in the tradition of giants like Ibsen, Strindberg, and Chekhov. The Past isn’t quite as thematically elegant or as sociologically rich as A Separation, but that’s like saying Texas isn’t quite as big as Alaska—they still dwarf practically everything else. And I look forward to seeing audiences discover that Bejo, who won the Best Actress prize at Cannes, can do a lot more than smile winsomely in a silent pastiche.